The room numbers are those referred to on the pompeiiinpictures pages for VI.15.5. 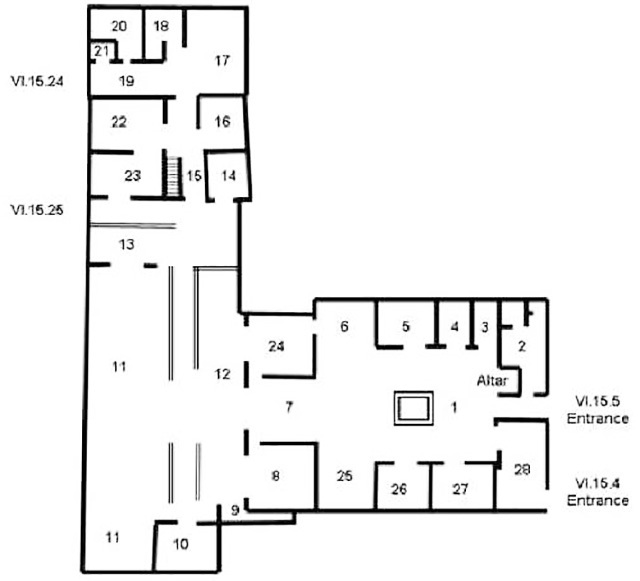 This plan is to help you accurately locate the rooms shown in the photographs of this house. Also shown are the entrance at VI.15.4 and the now blocked entrances at VI.15.24 and VI.15.25. Please be aware that the room numbers shown reflect the sequence in which we photographed the rooms and will differ from any other plans or records both published and unpublished.